– James Hilton, Lost Horizon. Funny to find an Antipodean neighbour way out here: a beanie-clad, mumbling, red-head New Zealander in the middle of Africa; him having asked about places I’ve been, then admonishing himself for being “too nosey”. After only one day, I’ve realised Keven talks to himself – constantly – the oddball Kiwi banter more rhetorical observation than prying. From our overnight digs, I’ve cajoled my city hire car along potholed mountain roads; Keven’s hand-painted van “no good on them hills.” At the carpark we’ve signed a hiker’s registration book. From there it’s 1-1/2hrs scrambling over more scoria to get here, on a narrow wandering track cut from the side of stoney parapets, all cliff and ragged tumbled rock; my lunchtime goal to sit atop a 3000m high, 5km long, sheer basalt cliff face called ‘The Amphitheatre’. We head off once more, another 1/2hr to a giant crevasse, a vertical, seemingly insurmountable stone overhang and a pair of rusted chain ladders hanging, hopefully well-anchored somewhere 50m above. Kev gives the first chain a good tug, muttering something about his lack of travel insurance. Atop the second flight I turn around and feel dizzy at the daunting spectacle, and the thought of our return. It’s another hour’s tramp across an alpine plateau, once a Dinosaur playground, now vacant and exposed. Finally we stop, Kev taken with green valley views 1000m below, and me with the steep walls of wild rocky ramparts across the way: the once isolated mountain kingdom of Lesotho. The silence is broken by the chirrup cry of a soaring Black eagle. “Wicked”, says Kev, scratching stubbled chin and sprouting whimsical comparisons with the Himalayan magic of Mustang, Bhutan and Tibet. Dragging his eyes from the roundabout wonderland, there’s a smirk on that freckled face as he shakes his head and repeats his earlier question; this time definitely meant for me. The air’s cold, the breeze fresh with an increasing chill. There’s the zip and rustle of plastic as Kev battles the wrapping on a packet of digestive biscuits. White water run-off gurgles and rushes, hurtling downwards from our stony pews. 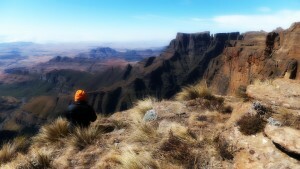 I ponder Kev’s question, me lost in Lesotho: those distant battlements seeming impossibly unreachable. Suddenly I feel Kev’s stare. But I keep no tally of peaks or places, these days preoccupied with a lack of time and where I’ve never been. Kev says nothing at first, nods, shades his eyes and lifts his gaze to follow my own across the way. He looks back at me and squints. It’s “Wicked”, once again. Snow drifts lay among wet patches of green lichen, dank pockets and dark crevasses; those castellated walls steep and forbidding, picture-book peaks that hide the great beyond. I’m immersed in a great pondering silence, travelling back to younger days: an often-distant kid in short pants, a faded Lesotho postage stamp – the head of a black man with a feather in his hair – and a dog-eared African map: dreams of a newly independent mountain kingdom. From the kitchen next door I hear the clink of brown beer bottles on a green-flecked Laminex table. There’s the smell of cigarettes and hot popcorn, the gruff banter of a larger-than-life uncle I sometimes heard but rarely saw; and late night tales of a dark and distant continent. Those dreams drift on the wings of my eagle, my second visit to Southern Africa almost over and having already booked a flight to Lesotho from Jo’burg: that bastion pocket of a country – once the last safe haven in an imploding world – the dream of a visionary village chief who sees the writing on the wall in the early 19th century, leading his harassed people from marauding Zulu armies and encroaching white farmers. I drag my eyes away, then up to a gathering bank of black cloud. Kev hoists his pack and waves towards the plateau. A rushed march and we reach the ladders; the nimbler Kev dropping over the edge and out of sight. The anchor rods shake, rusted steel scrapes on bare rock and I wait till it stops. I smell burning wood, beans and gravy. There’s chatter floating up from far below, the strains of that hybrid Kiwi lilt. I take a deep breath and am finally on the ladder myself, then a tiny ledge, and the second ladder where I hang mid-air and halfway. Kev chats to park rangers with weather-beaten faces and ratty, green overalls; the leader rubbing hands over a crackling cooking fire, antique rifle across bare knees. “Baboons”, the one word explanation. Back in Johannesburg, I’m waiting for final word on tomorrow’s flight; electrical storms and wild winds lash Lesotho and The Drakensberg. It seems I’ve again missed my chance, the flight cancelled. I wonder if some things are just meant to be: like the chance connection of an errant baboon and a quirky Kiwi called ‘Keven’; or a government decree banning climbers from sacred mountains in far-off Bhutan, or even the dashed hopes of an ageing dreamer seeking some Shangri-La. Ian, wonderful post, “wicked” good! I love the way you tell a tale. Great quote from “Lost Horizon,” and I always want to know what’s on “the other side of the mountain.” Kiwi Kev sounds like such an interesting guy, a real character as it were, and what fun to meet a New Zealander in the middle of Africa. That’s quite the hike you two took. Is Kev the hiker in the photos? What a view, although those heights certainly are dizzying. Awesome photos! “Almost Lesotho” … I found it poignant that the “often-distant kid in short pants” with the faded Lesotho postage stamp (I recall reading before of how you collected postage stamps from around the world as a kid) and memories of an uncle’s tales came so close as an adult and I hope for you that one day it can be so. Maybe “some things are just meant to be,” but it’s OK to be “an ageing dreamer,” I am one as well. Mmmm… I don’t think it’s ever occurred to me how affected I was by by Hilton’s book; not until writing this post. I find those nostalgic `throwbacks’ interesting. I guess it really is about not growing up. Yeah, that’s `Kev’ in the snap. I’m so happy the story took you back to that special point in time Nickey. Riveting as always, Ian. You seem to have a long history of leaving people and places behind. A true wanderer in an ever-changing world. I’ve never thought of things in that light. But yes, I suppose I have left lots of people & places. Travel is a great teacher though. Mmmm… yes, it’s often the getting down that’s the problem. Wicked of you to drop by Janene. You have the most interesting adventures, Ian. Kiwi Kev sounds like a real hoot! I’m sure you’d love NZ, if you haven’t yet got there. Our neighbours `across the ditch’ are indeed often `hoots’. All the best to you too Big D.
Glad you joined me on that trip. For many moments I dangled mid-air in that outback with you and the red-head New Zealander. I love how you fold time to converge on spots. The image and dreams from the childhood is so nostalgic. Yes, quite daunting to drop from the heavens on a rusty ladder. Funny what we remember… that postage stamp for example. Let me ask you what “that bastion pocket of a country – once a safe haven in an imploding world”…refers to? Ah yes Hels. Very mixed feelings with leaving. Will I have time to get back there? Who knows? The creation of Lesotho, from what I’ve read, was set in the Shaka Zulu days – very bloody times. Surrounding tribes must have thought their world was crashing down on their heads. Great post Ian. You always manage to transport me to the locations of your stories, I can almost feel the vertigo from here. Kev doesn’t sound like someone I’d want to travel far with though. So glad you came along for the trip. Kev? Yeah, one of those meetings never forgotten.